Hi! We were so excited for today! For it is a day we’ve been looking forward to since we started planning our itinerary 7 months ago. 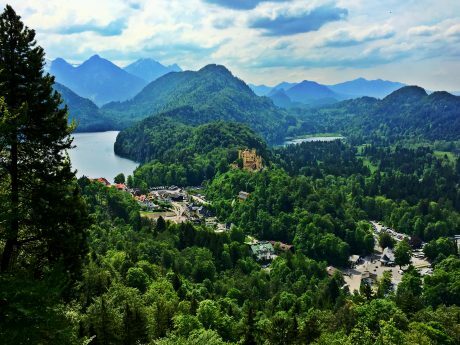 The day would include riding bikes in the countryside of the Bavarian Alps, and we’d get to see two famous and spectacular castles – Neuschwanstein and Hohenschwangau. We set up the tour via Viator with Mike’s Bike Tours. We walked 20 minutes from our flat to Mike’s Bike Tours office, which is conveniently located near Hofbrauhaus and Marienplatz. Along with about 25 other people, we boarded a spacious, air-conditioned bus. 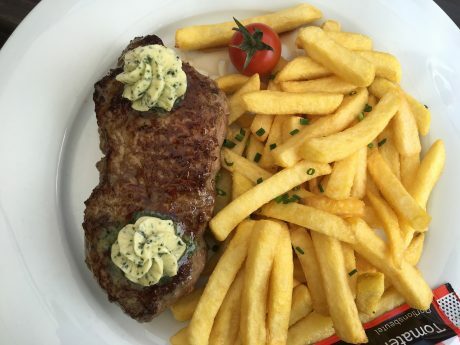 By the way, also check out Bus Bavaria. This is a partnership with Mike’s Bike Tours that makes for an even more awesome overall day tour experience.) The bus has a bathroom in it, and we were treated to a DVD and much “insider information” from our guide, Ryan, Mike’s Bike Tour. In addition, we could buy a water, beer or pop during the 2-hour road trip. Don’t fret about the time on the bus during this full day activity. It allowed for us to catch views of so much more beautiful country that we would have missed otherwise. Also, we ordered our food for the lunch we’d have later, which meant our food would be ready for us as soon as we finished our bike tour, and just in time to refuel and enjoy before starting the hike to the castle. And, like I said, the bus ride was pure comfort! Ha! 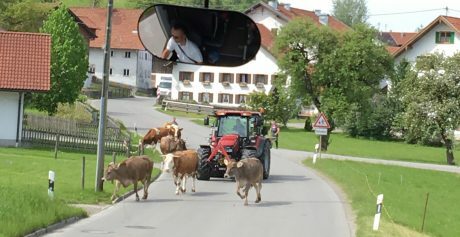 A Bavarian traffic jam. Our Wyoming traffic jams often have cows in them, too. 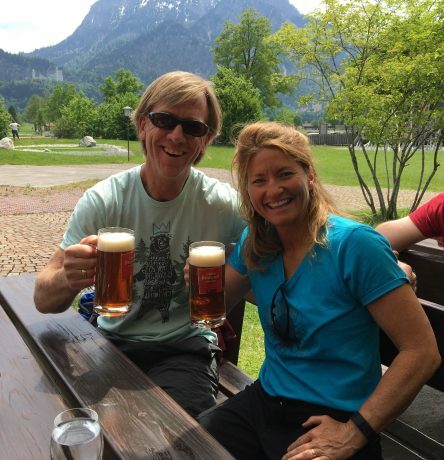 After enjoying sights out of the bus’s huge windows of the green hillsides and the snow-covered Bavarian Alps, we got off of the bus and quickly selected bikes and hit the trail with our wonderful and fabulous guides from Mike’s Bike Tours, Brad, Mica and Ryan. 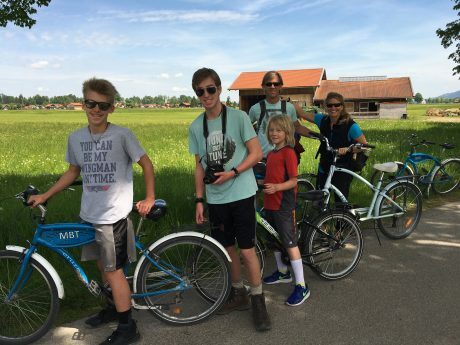 We LOVED riding bikes in the Bavarian countryside! 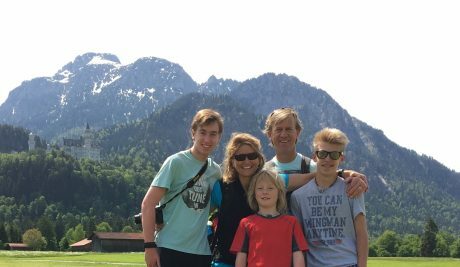 As we biked, there were wildflowers everywhere, and often, we could spy the spectacular fairylandish Neuschwanstein Castle, which we would hike to and tour after lunch, and also we could see the Hohenschwangau Castle. Neuschwanstein Castle is at left. Our sons, in front of Swan Lake. Group photo during the bike ride. That’s Neuschwanstein Castle in the background. 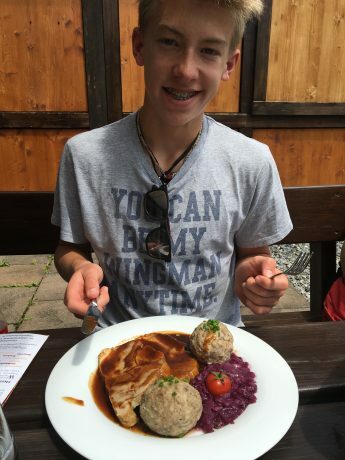 Hayden, about to eat his pork roast and dumplings and cabbage. 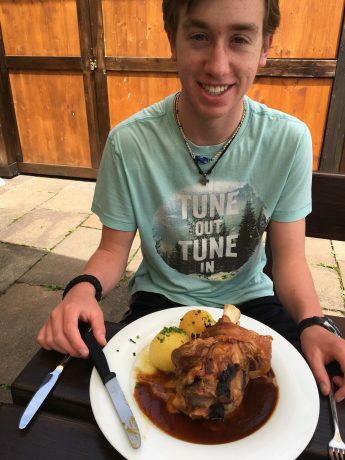 Wolf and his pork knuckle and potatoes. 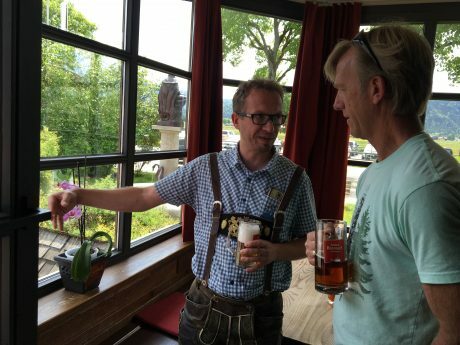 Jerry and I, enjoying the local braumaster’s private, small batch of beer. Jerry, getting a tour from the restaurant owner and brew master. 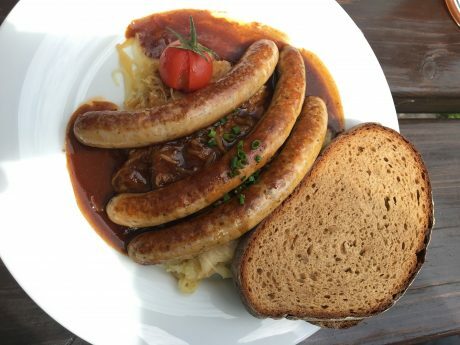 Another thing we loved about this particular tour provided by Mike’s Bike Tours, is that they gave us plenty of time to enjoy our delicious meal and relax and enjoy the scenery before hauling us off to hike to and tour the castle. There was plenty of time to really immerse ourselves in the scenery, the biking experience, the delicious meal, and still have plenty of time to hike and enjoy the castle, too. 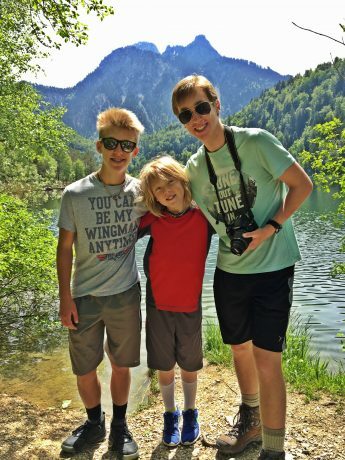 After getting our fill of great food and beer (and for the boys, Orange Fantas — which were described as “orange juice with gas in it”), we rode the bus for a few minutes and then started hiking a short steep hill so we could enjoy a guided tour of Neuschwanstein Castle. 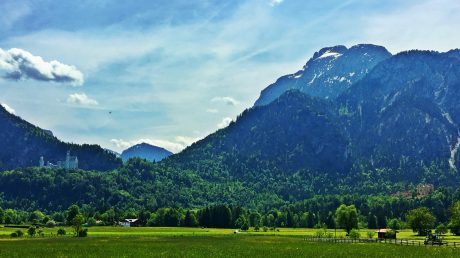 At the start of our hike, we could spy Hohenschwangau Castle, which was a treat since we had chosen to do a bike tour rather than also explore that castle. 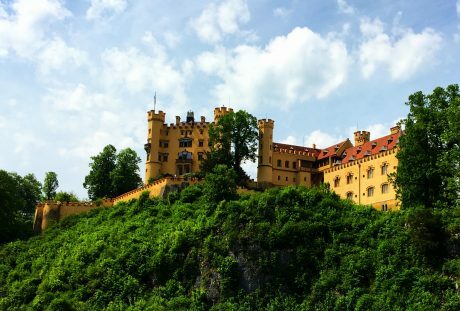 Hohenschwangau Castle (High Swan County Palace) is a 19th-century palace that was the childhood residence of King Ludwig II of Bavaria, and was built by his father, King Maximilian II of Bavaria. Neuschwanstein Castle (“New Swanstone Castle”) is a nineteenth-century Romanesque Revival palace on a rugged hill above the village of Hohenschwangau near Füssen in southwest Bavaria, Germany. 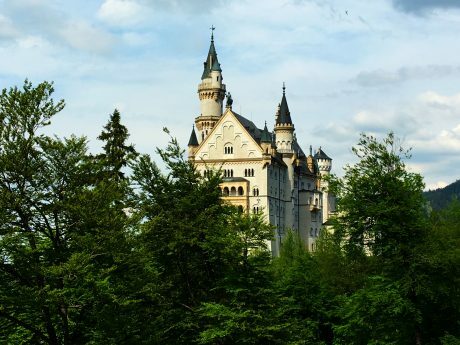 According to Wikipedia, the palace was commissioned by King Ludwig II of Bavaria as a retreat and as a homage to Richard Wagner. Ludwig paid for the palace out of his personal fortune, and by means of extensive borrowing, rather than Bavarian public funds. The palace was intended as a personal refuge for the reclusive king, but it was opened to the paying public immediately after his death in 1886. The palace has appeared prominently in several movies such as Chitty Chitty Bang Bang and The Great Escape and serves as the inspiration for Disneyland’s Sleeping Beauty Castle. The tour of the castle lasted about a half hour. The castle did not disappoint. It was beautiful and magnificent. The murals were out of this world amazing. We felt privileged to be inside of such a magnificent palace that is situated in such an awe-striking setting. We returned to Munch by 7:30pm, and couldn’t believe how fulfilling and exhilarating – and perfect – the day was for us. As a family, we’re keeping a journal of our trip. Every night we each contribute to the journal, and record our individual thoughts and highlights of the day. As we all took turns writing in the journal, we shared out loud that this was one of our best and most unforgettable days yet. We all give Mike’s Bike Tours a 10 out of 10. It was worth every euro and then some… We’ll never forget the day, and all that came with it. Thanks for reading, and please stay tuned for more posts here as we head next to Lauterbrunnen and Zermatt, Switzerland, Italy’s Cinque Terre National Park, Pisa, Florence and Rome, and Lisbon and Lagos, Portugal.